Have you ever wondered what are the letters of the Japanese alphabet? Sure you've heard the stories, the legends? About how there are more characters in the Japanese alphabet than there are good anime? Well, sadly, that's true. The Japanese alphabet has not dozens, nor hundreds, but thousands of letters! So many letters they need more than one single alphabet to organize them all! Above, we have the names of the three alphabets written with themselves, and the romaji ローマ字 showing how to read them for those who can't read Japanese. Now, let's see the words for the names of all the three alphabets written in each of all the three alphabets. I bet you're thinking, "wait a second, if you can write anything in either alphabet why have three of them to begin with?" Well, they happen to be used for different things. For example, katakana is often used for loan words an sounds, hiragana for grammatical particles and simple words, and kanji for normal Japanese words. Do note that you can't write anything in Japanese with kanji, but you can write anything in Japanese with hiragana and katakana. Now that we have some idea about the differences, let's see the kana, which are the hiragana and katakana, some Japanese symbols, and some shenanigans other things to watch out for in the Japanese writing system that I think should be noted. The idea behind hiragana and katakana is pretty simple. Each kana represents a syllable. Each hiragana has a katakana with the same sound and vice-versa. 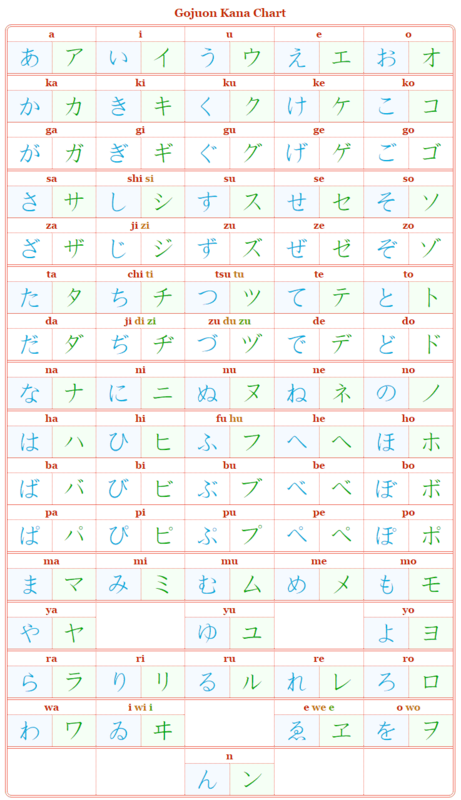 There are around 50 main syllables in total which mean around 100 kana in total, 50 for hiragana, 50 for katakana. So you could say the two most basic Japanese alphabets have 100 letters in total. Another thing is, in our alphabet we don't write syllables, we write vowels and consonants. There is no way to write "k" or "r" in Japanese, for example, only ka か and ma ま. The only exception is the n ん, but only because that is treated as a vowel in the Japanese language. There is also no way no "la" or "va" syllables in Japanese and you can't end a word in "l" or "r" like "shall" or "car." This is part of the reason the Japanese can't speak English right. Besides the kana above, there are also small versions of certain kana, specially the vowels, which are called literally "small kana," chiisai kana 小さい仮名. These are used to express that a syllable is longer than normal for some reason. Usually sentence ending syllables. The three small kana of ya や, yo よ and yu ゆ are also used to make compound syllables. These syllables always come after a syllable ending with the -i vowel, like mi み, ni に, ri り, etc. The idea is that a compound syllable just has a different sound and takes as much time to say as a single syllable, despite needing two kana to represent it. So instead of ni-ya にや, it would be just nya にゃ. In Japanese, instead of "quotes" the symbols 「 and 」 are used. They work just like quotes, and there isn't a lot to say about them. The small tsu っ, in katakana ッ, is sort of a big deal because it adds something like a small pause after a syllable to build up for a stronger start of the next syllable. 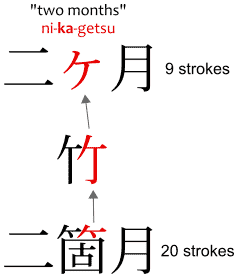 When romanized, the small tsu is represented by writing the consonant of the next syllable twice. It's also used at the end of sentences to put emphasis at the end. Usually when a character is angry, for example. This long dash ー, called chouonpu 長音符 or on-biki 音引き in Japanese, literally "long sound mark" and "sound pull" respectively, and called "prolonged sound mark" in English, is a line written in Japanese when the sound of the vowel is "longer" than normal. Most of the time, it's written at the end of sentences or in the middle of foreign words. This mark changes according to the direction Japanese is written. 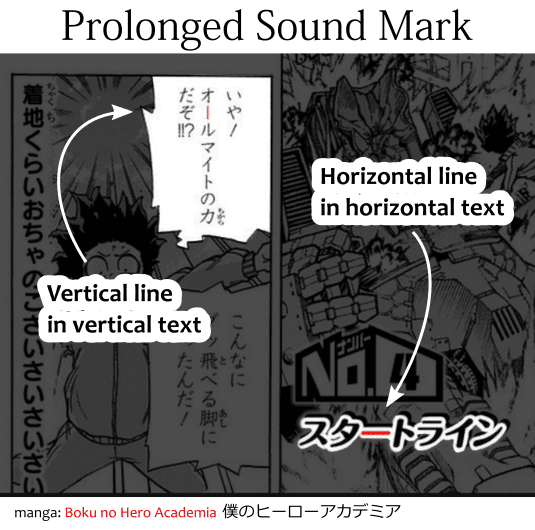 When it's written horizontally, it's a horizontal line, when it's written vertically, like it in manga and light novels, it's a vertical line. The small ke ヶis another special small kana. It's an abbreviation for a a kanji, this one: 箇, it's read as ka か instead, and it's usually found in words that count things, in particular, months. It can also be found in some names of people and things, but in that case it's read as ga が. The bouten 傍点 are dot marks or similar on the side of texts that put emphasis on a given syllable or word. They are like bold letters, except they don't use bold letters in Japanese, they use the bouten instead. After all these characters common in both hiragana and katakana alphabets, a question remains: why have two of these if they are the same? What's the difference between hiragana and katakana? So we know a sentence starts without searching for a dot. So we can tell names of people apart from random words. So we don't mistake an abbreviation for some weird word. So old people can chat in Facebook. Likewise, katakana has certain reasons to be used. Basically, katakana is only used instead of hiragana when you want to put emphasis on the sound of the syllables and not on the meaning of the word. Let's see some examples. 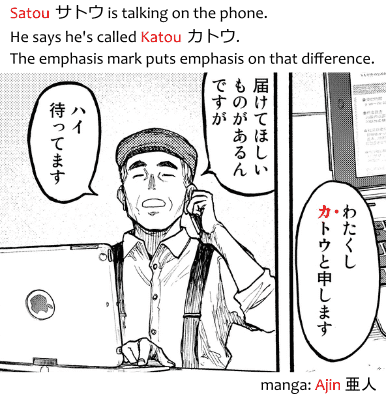 In the first example, the verb "to go," ike 行け, is written in katakana to put emphasis on how much sound, that is, how loud the character is saying it. Next, in bukkorosu ぶっ殺す, it's actually the verb "to kill," korosu 殺す, with "to strike," utsu 打つ, before of it. When used like this, it sounds like butsu for emphasis on impact. The use of katakana indicates extra emphasis on how strong the syllable was. The katakana is also commonly used in onomatopoeia. Words that describe the sound of something. Sound effects. And the Japanese language is literally filled to the brim with sound effects. To the point they even have something else: mimetic words, words that mimic not only sound but ideas! I'm in love. I'm excited. Etc. Sound effect for some abominable presence / character. Although there are exceptions where hiragana is used for them instead. Sound effect for an anxious situation. Besides these uses, katakana is also commonly found in dictionaries to spell out how a kanji should be read. And, also, how names of people and characters which are written in kanji should be read. 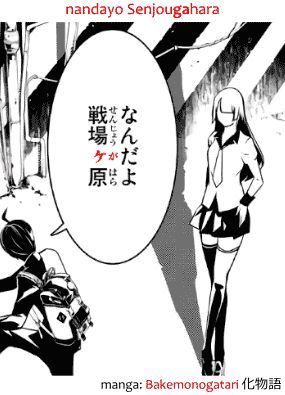 (see Furigana about that). This brings us to our final Japanese alphabet. The kanji is literally the tallest language barrier for people learning Japanese to read manga... or to read anything else, for that matter. Together, the 50-something kana of hiragana and katakana total 100-something kana. Over 3 times our little kawaii latin-alphabet of 26 letters. But the deal is, these 100 symbols for syllables are kindergarten level of alphabet. The kanji, on the other side, has so many letters, or rather, ideograms, that any Japanese student has to learn them from first grade in middle-school all the way to their last year in high school and that's just for the 2000 basic kanji. Yeah, I said 2000 basic kanji. The jouyou kanji 常用漢字, a.k.a. "everyday kanji," are a set of 2000-something kanji the Japanese government says are found frequently every day everywhere in Japan. Besides these 2000 kanji, there are a number of other kanji which are found often in newspapers, and books, etc. all the time. So just knowing these 2000 kanji doesn't mean you can read everything, it means you can read most things. For example, the kanji found in animals names, such as hyou 豹, meaning "leopard," is not something you see every day. Most of the time words like hyou have to be written with hiragana, like ひょう, or katakana, like ヒョウ, because, if written with kanji only, nobody would be able to read it! What I'm trying to say, is, not even the Japanese people themselves know all of the kanji. And even those basic kanji they do know how to read, they may not be able handwrite them, because they are so difficult to remember. But what are kanji, exactly? Well, they are not words. A kanji is a letter that has a certain meaning. Or multiple meanings. And a certain reading, a way to read it, that can be one syllable... or more syllables, or, perhaps, more than one reading. Well, anyway, you get it, it kinda varies. Besides that, Japanese words may have multiple kanji in it. A Japanese word is... a word. It has its own meaning and a way to say it. So, basically, a word with one kanji has a meaning closely related to that kanji, but a word with two kanji would have a mixed meaning and a mixed reading. As you can see, the kanji kind of tell what the word is about... most of the time. If you have otoko 男, which is a man, and ko 子, which is a child, then you have danshi 男子, which would be a man-child, err, a "young man," or, sometimes, "boy." Note that although danshi 男子 is a word, dan 男 and shi 子 are not words. That is, you can't say dan 男 to mean "man," or "male," or anything like that. Because it's not a word. The technical name for a part of a word that has a meaning is a morpheme. A different word written with the same kanji may have a different meaning. For example, otoko no ko 男の子 means "boy." Likewise, you can have synonyms in Japanese that are written totally differently. Like shounen 少年, which is a bit different but also means "boy." A common thing in Japanese has that's like synonyms are homonyms. Two words pronounced identically but written differently. Let me show you. See? The first shibou written with the kanji for death itself, 死, and the one for losing something, 亡, means "death." But the other shibou, written with kanji related to hope, means "hope." This sort of mess is the reason why you shouldn't even bother learning the kanji by themselves. They make no sense without a context, without a word, and you'd just be hitting your head against a wall when you see them used in actual words. An extreme example is the ateji 当て字 word mechakucha 目茶苦茶. So here we got, in mechakucha 目茶苦茶, kanji that range from eye/target, to tea, to pain and... with that... we can conclude... it means... uh... wait, we got the tea kanji twice. ".... for example, only ka か and ra ま"